S tudents of political science and international relations are accustomed to the term ‘soft power’ as coined by Prof Joseph Nye of Harvard University. Soft power refers to factors such as values and cultures which are primary currencies in influencing world politics. This is opposed to notions of hard power, where the use of military force and coercion are paramount. In this article for the Sunday Plus in Pakistan’s The Nation, Sofiah Jamil shares her views of how Junoon (commonly dubbed as the U2 of Pakistan) is by far one of the best examples of soft power. As the American poet Henry Wadsworth Longfellow, once said, “Music is the universal language of mankind.” Junoon’s songs have crossed linguistic and territorial boundaries far beyond the Indian sub-continent. Although the group disbanded in 2004, its music continues to be a shining beacon of peace and love. 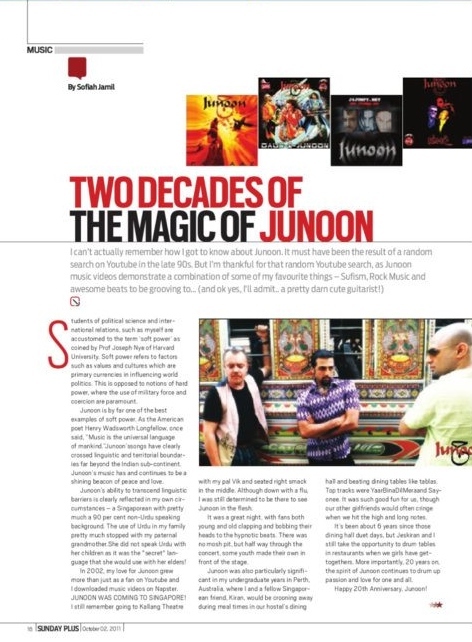 The article was written in conjunction with Junoon’s 20th anniversary in 2011.